I’ve rolled the dice and decided to go all in this morning. It’s 9:15 AM and I’m standing along Parliament Street waiting for the parade to begin. Yes, the day in cold and the sky is threatening rain. And yes, I will be standing here for hours. Again. What can I say? I’ve been caught up in the spirit of the moment. 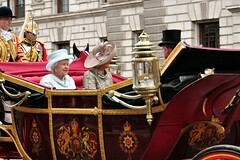 I am in the front row, and I want to see the Queen in her carriage. Before long, I’m joined by a pair of lovely English ladies, Lilly and Reeny. 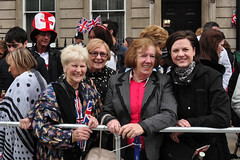 They’re veterans of these royal events, having been somewhere along the street together when Kate Middleton married Prince William last year. I’ve also grown chatty with the local police, including Constable Olivier, who offers to have his picture taken with me, and the handsome Officer Blonsky, who my companions decide I should marry. 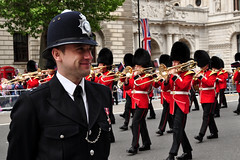 The hours melt away pleasantly, and as the crowd grows in size the police officers lining the route take turns conducting the wave. 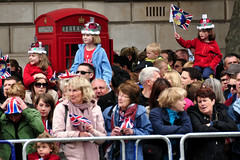 Across the street, there are several young girls wearing paper crowns, and one in particular with ginger hair who has a gigantic headdress of flags upon her head. Over a loudspeaker, we can hear the service going on at St. Paul’s Cathedral. At a quarter to one, the Queen’s limousine speeds by and I see her as a blur of mint green. She’s on her way to a luncheon at Westminster Hall, and she seems rather in a hurry to eat. I only have time to get off a few frames on my Nikon D5000, and in one of them Reeny’s left pinkie finger covers the Queen’s face entirely. I tease her about ruining my opportunity and Officer Blonsky jokes that she should keep her hands down next time, especially since her own camera is about to run out of battery power. I exchange e-mail addresses with the ladies on the street and promise to send them my best shots of the day. 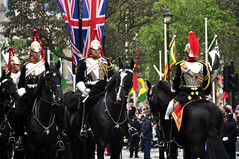 It’s twenty past two when the Queen’s carriage arrives at last, led by two men in red coats and black top hats, riding a pair of Windsor Grays. She’s not in the Gold State Coach that drove her to her coronation in 1953, much to the disappointment of a little girl I overhear complaining to her mother nearby. Apparently, despite its opulence, it has little suspension and makes her seasick. Instead, she’s with Charles and Camilla in the 1902 State Landau, a carriage I saw in the Royal Mews just the other day, and its open top allows everyone to see them clearly. My camera is set for multiple exposures, so I hold down the shutter and hope for the best. One, two, three, four… a dozen shots or more. When I look down later, I’m relieved to see that some are quite good. 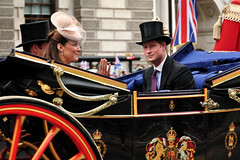 Prince William comes next in a carriage of his own, accompanied by his wife, the Duchess of Cambridge, and his brother Prince Harry, who I capture looking towards me with a bemused expression on his face. Kate is smiling and dressed in beige lace, her hand raised in a wave. It’s a wonderful picture, really, and when I pull it up on the camera’s screen it earns the admiration of Lilly and Reeny, and even Officer Blonsky, who has been a good sport all day to put up with us. The crowds are too heavy heading over to The Mall, so there is little hope for me to see the balcony appearance at Buckingham Palace. I decide to head back to the Rubens instead. I still have a train to catch and the afternoon is nearly done. 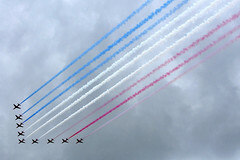 From the sidewalk in front of the hotel, though, I am able to see the flypast, with its squadron of World War II aircraft and a formation of nine Red Arrows that trail vapors of red, white, and blue behind them. By the time I gather my things and check out of the hotel, the rain which has held off most of the day is coming down in sheets. Buckingham Palace Road is still closed to traffic, so a doorman walks me around the corner to call a taxi, and waits with me, holding an umbrella over my head. At the last minute, as I slip into the backseat of the cab, he thrusts a half dozen British flags into my hands and wishes me well. In just a short period of time, the Rubens has become my favorite hotel of all time, and their staff the kindest I have known. From Paddington Station, I board the 4:30 PM train to Bath, exhausted but exhilarated by the weekend’s events. I meet Sue, the proprietor of 3 Abbey Green, and settle into the Lilliput Court room. I also take her advice by stopping for dinner at Demuths, a vegetarian restaurant just around the corner near Sally Lunn’s. I order a “mushroom parfait” as my main course, and while it’s an attractive plate of food, drizzled with parsley oil, the overabundance of purees make it taste a bit like baby food. It leaves me feeling hungry. Afterwards, I take a short stroll around town, past the Abbey and several souvenir shops that have closed for the night, their windows cluttered with flags and t-shirts and waving queens. 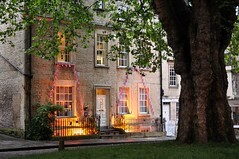 Bath is quiet once the day trippers have gone home, and even more so in the misting rain. The last time I was in Bath was in 2007 and I cut my visit short because of the weather, so it’s painfully ironic to see the city looking just as sodden this time around. As I head up to bed, thinking of the bus tour I’ll take in the morning to Stonehenge and the Cotswolds, I can’t help but pray for a break in the clouds, knowing all the while that it will not come. I am here for what is destined to be one of “the wettest, dullest and coldest” Junes on record in the UK. It’s best I make my peace with it.